Sulfites, such as sulfur dioxide, not only help prevent foods from becoming discolored, they also discourage the growth of bacteria. Additionally, they can soften dough or bleach foods. Although most people don't experience any side effects when they eat dried fruits preserved with sulfur dioxide, about 1 percent of the population is sensitive to these chemicals and may experience potentially dangerous side effects. If you are among those who are sensitive to sulfites, you need to avoid foods that contain sulfites. In sensitive individuals, sulfites can cause allergic reactions. These allergic reactions can be relatively mild, such as hives, or more severe -- such as difficulty breathing and potentially fatal anaphylactic shock. For this reason, any food that contains sulfites in a ratio of at least 10 parts per million must include a warning on the label to enable sensitive individuals to avoid these foods. Some sensitive individuals also experience other side effects after eating sulfite-containing foods such as low blood pressure, flushed skin, stomach pain and diarrhea. 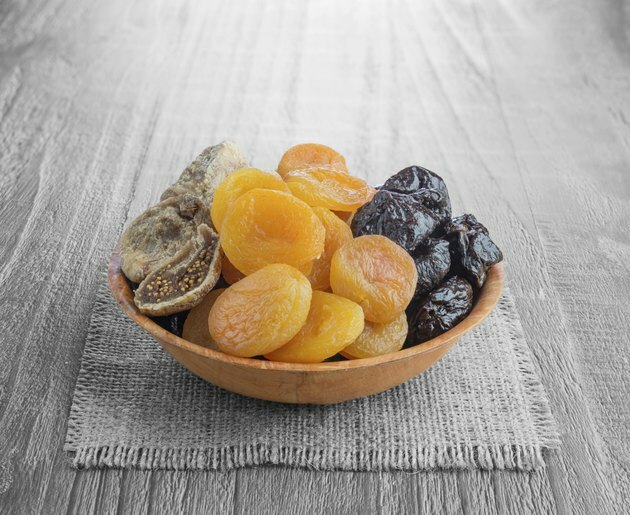 People who have asthma are more likely to suffer adverse reactions after eating foods that contain sulfites such as dried fruits. Between 3 and 10 percent of asthmatics experience these reactions, and those who have marked airway hyperresponsiveness, steroid-dependent asthma or chronic childhood asthma are more likely to experience severe reactions to sulfites, according to an article published in "Clinical and Experimental Allergy" in November 2009. It isn't clear why some people are sensitive to sulfites or what causes these reactions to sulfites. In some instances, people lack an enzyme that digests and removes sulfites from the body; in other cases, sulfites may cause an immune response. Another theory is that when digesting these foods, the stomach may produce sulfur dioxide, and inhaling this gas causes adverse effects, according to the University of Florida Extension. Dried fruit isn't the only food that sulfite-sensitive individuals need to avoid. Foods such as wine, tea, juices, beer, hard cider, baked goods, molasses, gravy, condiments, dried soup mix, jam, pre-cut potatoes and shrimp may all contain sulfites. Read the nutrition labels on processed foods and avoid any that contain potassium bisulfite, sodium metabisulfite, potassium metabisulfite, sodium sulfite, sulfur dioxide and sodium bisulfite.